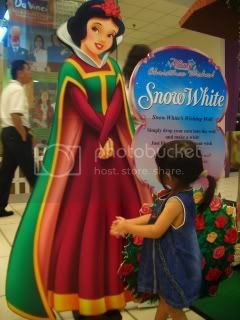 Yiyi loves Snow White. Every night, before she went to sleep, she must listen to the story. Poor Mami would have to repeat it 5 times, before she slept. 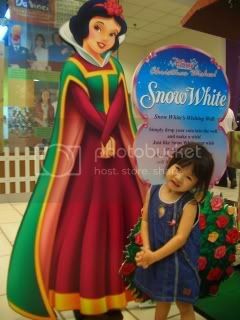 So when she saw "Snow White" in Ikano, she wanted to take a picture with 'her'. 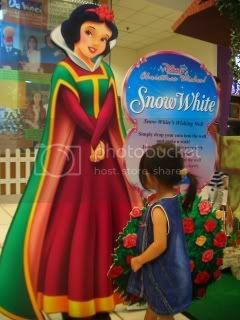 "Mami, Mami, I want to be like Snow White..."
"Hmm..OK...I just hold my hand....like this..."
Been quite sometime since I posted. Been busy, me with projects, and Mami with her new work place. I'll post an update when I got the time, ok? 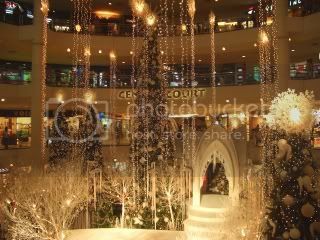 We went to Mid Valley to check out the deco there. Very impressive, and beautiful. 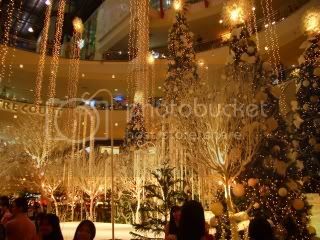 It really felt like it's a white christmas in Mid Valley. 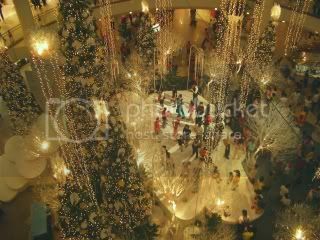 There were lots of people, everyone in a holiday mood. Christmas carols were playing in the background, Santa was making his rounds, with two Santarinas. 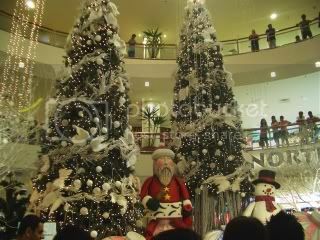 But poor Santa was swarmed with people, for a photo opportunity. I like the deco in the centre court. 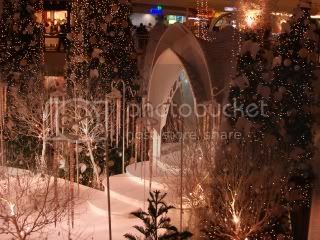 So beautiful, with a touch of Lothlorien/Narnia feel to it. 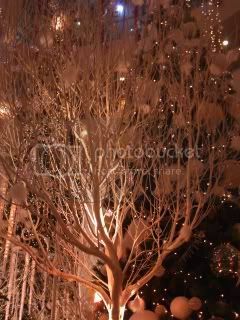 If you ask Yiyi about Christmas, she'll go "ting ting ting, ting ting ting, ting ting ting ting ting" (Jingle Bell). Mami : Did you read James's "I want cheese"
Papi : No, I haven't been reading blogs for a long, long time. Too busy ler. What's it about? Mami : James wanted a second child, but Mae's not ready. Mami : So they agreed to try only when Jesse can say "I want cheese". Mami : Yeah, the problem is, Jesse have difficulity pronouncing "Cheese". Papi : *rollover* So, ...do you want cheese? Mami : No, I want sleep. Mami : One enough lor. But you go buy, I malu lar. Papi : Why malu? Nothing what? Mami : Aiya, you go buy lar. Papi : OK lar, OK lar. Papi : Boss! 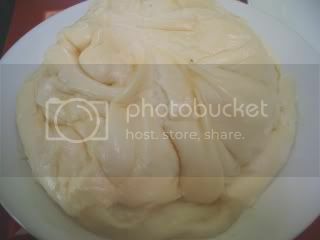 Yip Chi-Mei Big Pau! One! Papi : Give me nice one ah...I don't want the leaking Pau. Pau Boss : OK OK..
That's the monster Pau on our 12-inch plate. Enough to feed two. It has chicken, pork, turnip and some other ingredients inside. 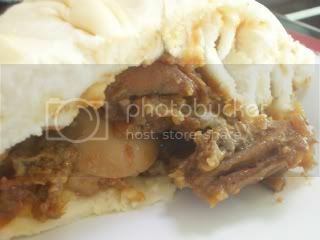 A pau businessman probably came up with this idea of a big pau after a Cat 3 Hong Kong movies marathon. So at the end of the movie marathon, he probably felt hungry and while eating his normal-sized pau, he wished it was Amy Yip's "pau" he was holding. Eureka!! LOL!! So Yip Chi Mei Dai Pau was born. Cat 3: Hong Kong movie rating system; Adults only. The life of Papi and Mami and their beloved daughter, Yiyi.